A wonderful deciduous shrub, Deutzia gracilis Nikko is low growing and with masses of pretty white flowers in spring. It grows well for us near the dripline of a large deciduous tree, (see picture right) and although it would be a bushier plant with a little more sun it serves its purpose for us in a semi shaded position. Reaching around .5m – .8m in height and when grown in a sunny position, forming a nicely rounded mound over time it will spread to a round 1m. A humus rich, moist but well drained soil is best. 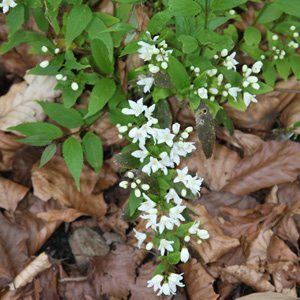 Excellent as a ground cover plant and very pretty next to a path when in full flower. Also known as ‘The slender deutzia’ and dwarf deutzia. So lots of sun in spring and part shade in summer. Full sun is also suitable although protection from the hot afternoon sun in warmer areas is a good idea. Deutzia gracilis Nikko is a little difficult to find, but worth the search. Prune after flowering to keep a little more compact if required, however we let ours sprawl a little beneath a large deciduous tree.